In the past fiscal year, the State Patrol's Executive Protection Unit overshot its $2.6 million budget allotment by $400,000, with overtime and travel accounting for 62 percent of the higher-than-budgeted spending, according to a Patrol analysis. Over the past year, Gov. Jay Inslee has crisscrossed the country in his role as chair of the Democratic Governors Association, visiting more than a dozen states, from Hawaii to New York, and most recently stumping this month for candidates in Florida and Georgia. The spike in out-of-state political travel has heightened Inslee’s national profile as he considers a possible 2020 bid for president. 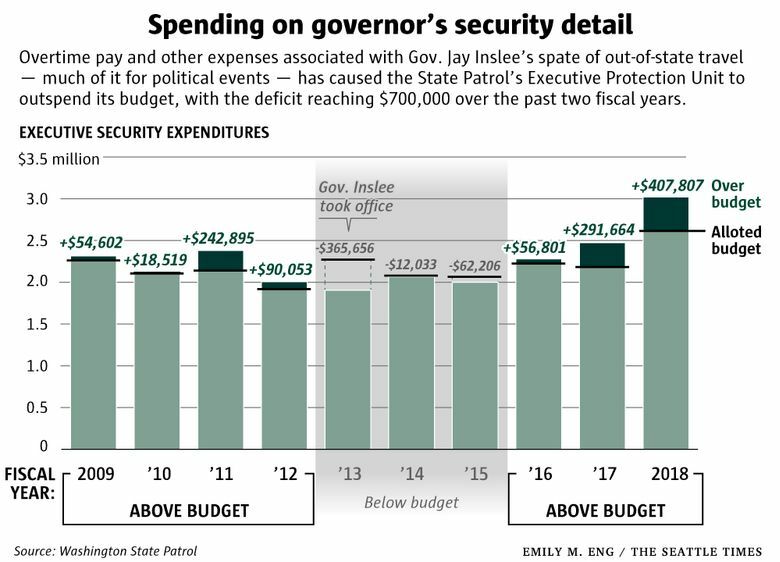 It also has helped bust the taxpayer-funded budget of the plainclothes State Patrol security detail assigned to protect the governor, leading the Patrol to seek a $1.3 million budget increase for the unit. In the past fiscal year, the Patrol’s Executive Protection Unit (EPU) overshot its $2.6 million budget allotment by $400,000, with overtime and travel accounting for 62 percent of the higher-than-budgeted spending, according to a Patrol analysis. 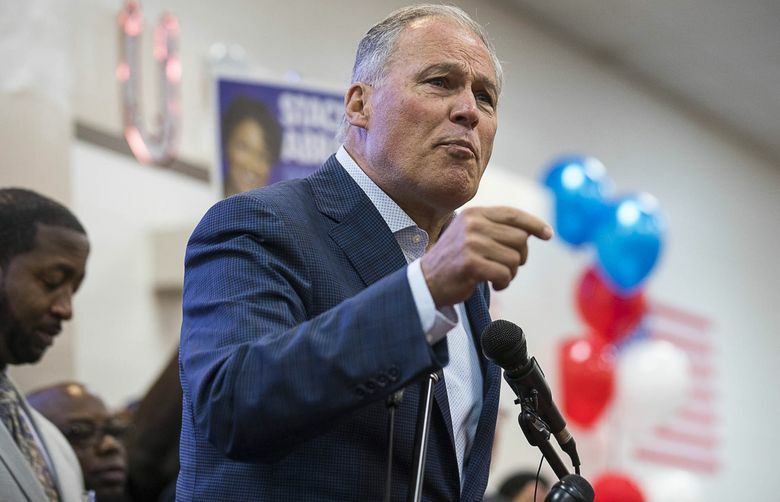 Driven largely by Inslee’s out-of-state trips — both for political events and official business — overtime pay now accounts for 40 percent of the unit’s costs. Two troopers whose duties included separately accompanying Inslee on political visits to New York and Miami in July each racked up more than 90 overtime hours that month, at a cost of more than $12,600. The security detail is a specialized eight-person unit, akin to the U.S. Secret Service. Its troopers drive Inslee to and from events, and hover in the background, keeping an eye out for threats. On travel days, one trooper typically goes ahead of the governor to prepare for his arrival. A second travels with Inslee and “must sit close to the Governor” even if that means flying business class, according to a State Patrol budget document. Because troopers are required to stick close to the outdoorsy Democrat, they have charged the state for expenses including renting cross-country skis in Montana and a bicycle in Nantucket, Mass., according to hundreds of pages of travel records released to The Seattle Times and Northwest News Network under the state Public Records Act. The burden has led the State Patrol, which is required by state law to protect the governor and his family, to request a $1.3 million budget increase over the next two years for the security detail. That would pay for hiring an additional trooper, as well as covering anticipated overtime and travel. Inslee’s term as Democratic Governors Association (DGA) chair ends in December. But the Patrol’s budget request predicts Inslee will boost his out-of-state travel over the next two years, though officials said that should not be taken as a sign of the governor’s 2020 ambitions. 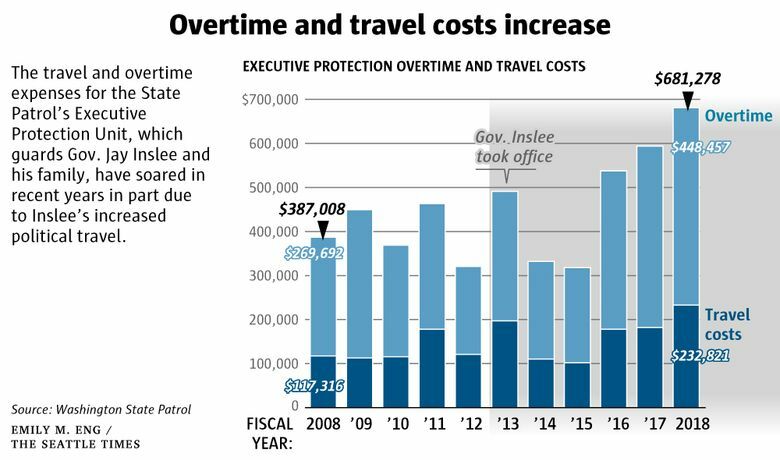 A State Patrol analysis shows that since fiscal year 2015, the Executive Protection Unit’s spending has gone up by more than $1 million, with overtime and travel costs more than doubling. Even before he became DGA chair this year, Inslee’s travel schedule, along with the fact he maintains a home on Bainbridge Island, was beginning to take a toll — on the troopers who protect him and First Lady Trudi Inslee, as well as the protection unit’s budget, according to the sergeant who heads the detail. The emails from Alexander and Crichton were both released this month along with other documents after a public-records request. The strain on the small unit — which represents a tiny slice of the State Patrol’s $691 million biennial budget — also has led it recently to borrow some troopers from its field operations bureau, which enforces the law on state highways. The Patrol’s written budget request says adding another trooper to the unit would ease the workload by allowing troopers to rotate in and out of work, training and vacation time. “This is beneficial to all concerned as exhausted troopers put themselves and the Governor at risk,” the request states. Between January and August, Inslee spent all or part of 49 days traveling out of state on DGA-related business, according to an analysis earlier this year by the public radio Northwest News Network and The Seattle Times. In addition to campaign trips, Inslee has traveled this year in his official capacity, including to the World Economic Forum in Davos, Switzerland, in January. On his political trips for the DGA, the association has used campaign funds to cover travel expenses for Inslee. But Washington taxpayers have remained on the hook for the State Patrol troopers, including airline tickets, rental cars, hotel rooms and overtime. The DGA raised a record $63 million in donations in 2018, according to an October news release. Inslee boasted in an interview earlier this month that the cash haul allowed Democrats to compete in governors’ races in states they otherwise might have overlooked. 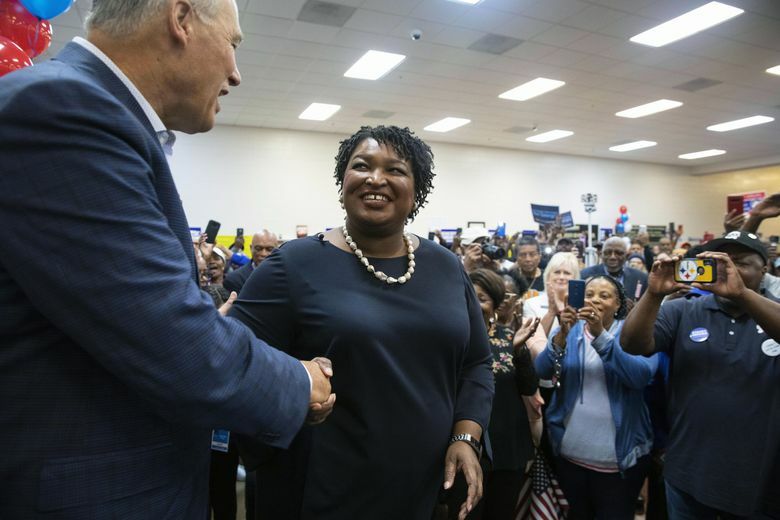 Democrats picked up seven governorships from Republicans in the midterm election. A Patrol spokeswoman said the agency hasn’t sought reimbursement. “We are required to provide security for the governor and his family … and that is what we do. We don’t look at the other side of it,” said Capt. Monica Alexander. The need to provide such security for the state’s chief executive is not merely theoretical. Like many politicians, Inslee has been the target of occasional threats; last year a Ferndale woman was arrested after a phone call in which she allegedly threatened to shoot Inslee, according to The Bellingham Herald. In 2003, then-Gov. Gary Locke was the target of a reported assassination plot by an anti-government extremist who scoped out the governor’s office during several “dry runs” to the state Capitol. The man was arrested on federal firearms charges. At times, the unpredictable nature of the governor’s cross-country schedule has led to added expense. A trooper’s one-way ticket back to Seattle from that conference wound up costing taxpayers more than $1,250, records show. On another trip, to New York City, a car rented by a trooper was impounded, resulting in a $185 towing bill. It’s not unusual for taxpayers in other states to cover costs for security details on political excursions by governors. But the expenses have often given fodder to their political opponents and critics. Several erstwhile 2016 presidential candidates faced blowback for such costs. In Louisiana, lawmakers tried to cut off funding for the security detail of then-Gov. Bobby Jindal, a Republican. Jindal vetoed the provision in a budget bill, according to The Times-Picayune. After coming under similar fire in 2015 for travel expenses ahead of his short-lived presidential run, Wisconsin Republican Gov. Scott Walker agreed his political campaign would cover some of the costs for his state security detail, such as hotels, rental cars and flights, according to the Milwaukee Journal Sentinel. This story was reported in conjunction with Northwest News Network, a collaboration of public radio stations in Washington and Oregon.